London crackle bed ... epitome of style. Available in crackle white gold, it gives a sense of peace and serenity. 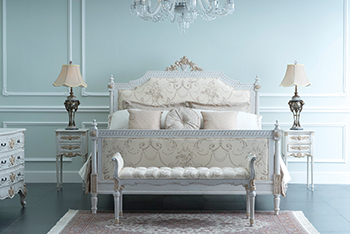 The bed can be paired with matching side tables, chest of drawers and upholstered bedroom bench, says the Emirati brand. The stylishly-crafted London crackle bed is priced at Dh7,119 ($1,937) with bedside table at Dh1,298, chest of drawers at Dh3,335 and bedroom bench at Dh2,222. “Our London crackle bed comes as a complete set that includes everything you need to outfit the entire bedroom. It is perfect for a cosy look and its soft hues render a feeling of tranquility,” remarks Amit Yadav, the marketing manager at 2XL. The retailer currently has nine showrooms across Abu Dhabi, Dubai, Sharjah, Fujairah and Al Ain. The 2XL product range includes exclusive bedroom, living and dining room furniture as well as exquisitely crafted décor items, plush rugs and wall art, bath linen, eye-catching tableware, and a fun, functional kitchenware range, he adds. Tundra ... colour of an infinite expanse of mosses and lichens. Ritmonio is set to make its mark in the world of architecture and interior design with the launch of the Haptic tap series which features handles in concrete. “Ritmonio is the only company in the industry that has thought and proposed the use of concrete for the control of the taps,” says a spokesman for the Italian company. Based on the Concrete concept which involves the use of cement resins in the designer tap industry, the series is now available in a choice of colours. “After a steady search for new techniques for the production of this material, Ritmonio has launched the ‘The Colours of the World’ project, in which the handle in concrete is presented in different colours for the first time, inspired by nature,” he adds. Eight colours are available: Tramonto, Canyon, Oceano, Vulcano, Artide, Tundra, Amazzonia and Sahara. The Haptic series, therefore, overcomes the generally held notion of concrete being a single-colour element connected to industrial environments, and focuses on elements of great visual impact, perfect for interior design environments, he says. 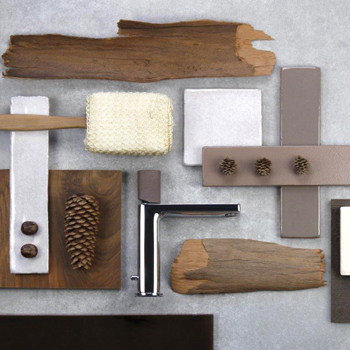 In the control element in the tap’s handle, “the tactile dimension of concrete is emphasised and perceived as soft, warm, almost sensual; a rough and structural material that – thanks to the use of the colour – find itself as velvety and gentle,” the spokesman adds. Tab ... features built-in wi-fi and the video door app. 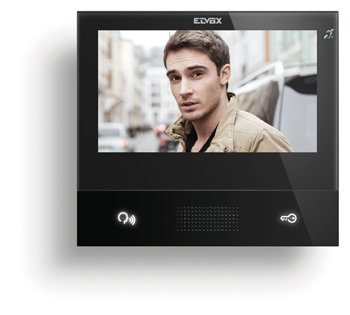 Italian home automation company Vimar has released new video door entryphones, with sophisticated design and new functions. Inspired by the light, essential design characteristic of all models in the Tab series, the new thin-profiled Tab 7 and Tab 7S come with an attractive glass finish in two classic colours – black and white. In addition to standard video door entry functions (call answering, gate and door opening, intercom calls and lighting) Tab 7S – with built-in wi-fi and the video door app – also allows these functions to be accessed from smartphones and tablets. Also available with IP technology, the new Tab 7S video entryphone also has an immediate and sensitive touch display, used to manage all commands with a simple touch. “Tab 7 and Tab 7S are the ideal solution for both small and large systems, combining cutting-edge technological products with quality and the style that has made Italy famous around the world,” he concludes.